You get to choose the painting for your party from our collection of over 8,000 paintings! Once your party is booked, we will email you a link to the gallery so that you can choose your painting. You will be able to choose from 2 hour ($35/person) or 3 hour ($45/person) galleries. Custom paintings, like Paint Your Pet, screen art, wine glasses and large canvas options are also available for private parties. You get your own private party room and your own artist-instructor to guide you on your way to your masterpiece. You don't set up or clean up - you just show up! You pay the same price per person as our public classes. Feel free to go over the top! Hire a caterer, come in costume or decorate any way you choose. Hosts of parties of 20 people or more receive a $35 gift certificate for a future class! If you're hosting a bachelorette party, we add in an extra gift of a handpainted, personalized keepsake for the couple, which guests can sign! Also, ask us how the bride can paint for free! We provide all of the art supplies, as well as cups, napkins and corkscrews. You can schedule your party any day of the week, space permitting. We have morning, afternoon and evening slots available 7 days a week. Please note we do not offer childrens parties that end after 6pm. What are the minimum or maximum number of painters for a party? Our Main Studio can accommodate a maximum of 48 guests. Our Smaller Studio can accommodate a maximum of 42 guests. The minimum number of painters required for private parties on Friday and Saturday nights is 15. The minimum number of painters required for private parties at all other times of the week is 10. Children's Parties are $250 for 10 painters PLUS the birthday child. If this is a birthday party and 10 guests are in attendance, the birthday child paints for FREE. One complimentary seat per party only. How do I reserve and pay for my party? Check out our calendar to see when our studio is already booked. Choose a time slot that works for us both. Please email us at studio232@paintingwithatwist.com, call us at 610 572 4050 or complete and submit the online request form which is on our homepage. We'll contact you and confirm if your chosen time is available. At that point we will send you our Party Contract and ask for a credit card number to secure your booking. A deposit is required to reserve a Private Party, unless the party is booked less than 7 days prior to the event in which case we ask for the minimum requirement to be paid in advance. Once you have chosen your date, returned your signed contract and secured the deposit with a credit card, the party will appear on our calendar. Sorry, but we do not accept checks or Gift Certificates as deposit for a private party. Private parties can be booked as either a two hour image at $35.00 per person, or a three-hour image at $45.00 per person, depending upon the art piece you choose. You will always receive an extra hour for socializing free of charge regardless of your project choice! Children's parties, for painters 7-12 years of age, can be booked at $25.00 per person, provided the art choice is made from PWAT'S 12 and Under art gallery. Please note this option is only available to painters under 12 years of age. Your guests may pay in advance, as they arrive or you may pay for the event in one payment. We have a 14 day cancellation policy. A $150 fee will be applied to your credit card if cancellation occurs less than 14 days prior to the event. How soon can I schedule my party? The sooner, the better! We can schedule 12 months in advance, so don't lose out on your first choice, book today! How do I pick my painting? Once your event is booked and confirmed you will be sent a link to our fabulous art gallery to select just the right art of your event. Choosing is a party in itself - there are over 8,000 wonderful pieces to choose from! If the party minimum is not met, the credit card on hold will be charged the difference. Classes will begin promptly at the scheduled time, so please ensure all your guests are aware. 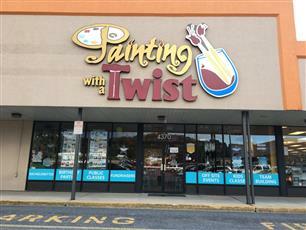 Painting with Twist will provide all the canvases and art supplies you will need. Please remember that acrylic paint will stain clothing, so no Prada please! We do provide aprons, however, we are not responsible for any damage to personal items. Guests may bring their own snacks and beverages. Please only painting guests in attendance!! We cannot accommodate others who just wish to watch or socialize due to fire codes and occupancy laws. 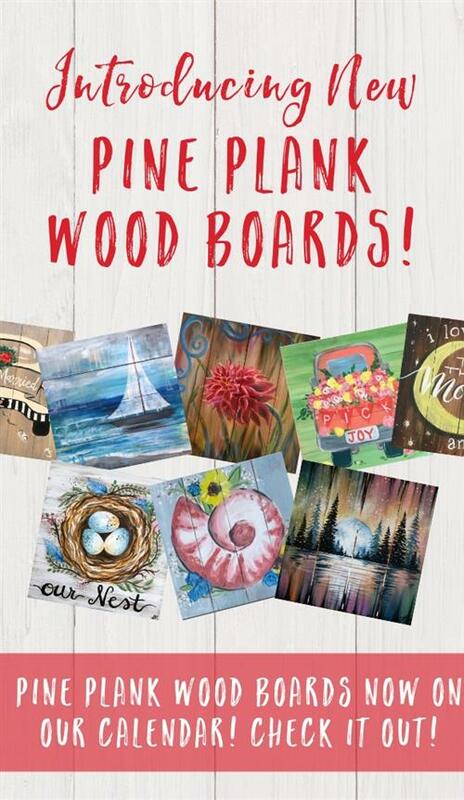 Find a reason for a Painting with a Twist party today - your friends and family will love you for it! We are BYOB - we only serve paint water and fun! You must be 21 or over to consume alcohol in our studio. Public Classes after 6 pm are 14+ (under 16 must be accompanied by an adult). We welcome age 7 and older for Family Day or afternoon classes. For Kids Parties, ages 7-12 is perfect.